Children’s mental health is as important as their physical health. It’s not always obvious when a child is struggling emotionally, but recognizing the symptoms and seeking early and effective mental health services are important for long-term health. At CHOC Children’s, we believe mental health treatment should be fully integrated with physical health treatment. Our psychology team works closely with the medical team to attend to our patients’ emotional, behavioral and developmental needs through inpatient and outpatient therapy. Many health conditions, like epilepsy, cancer, diabetes or a rare disease, can affect a child’s mental health in addition to their physical health. Our psychologists are part of the care teams for CHOC’s many treatment programs, both inpatient and outpatient. That means both a child’s physical and mental health needs are always being met. Patients and families can turn to our psychologists while receiving care anywhere at CHOC. If your child is hospitalized or has an appointment, and you would like to request a visit from a psychologist, please let your nurse or doctor know. Our team will develop a plan to care for your child. Deal with stress, anxiety, depression, grief, trauma and other psychosocial needs. They use techniques ranging from “talk” therapy, to medical play, to alternative coping methods such as hypnotherapy and biofeedback. Our psychologists tailor treatments to each patient’s age, comfort level and unique needs. CHOC Children’s is a member of the Center for Autism & Neurodevelopmental Disorders, in collaboration with UC Irvine and Chapman University. The center provides services for children from birth to 22 years of age with autism, ADHD and other conditions. 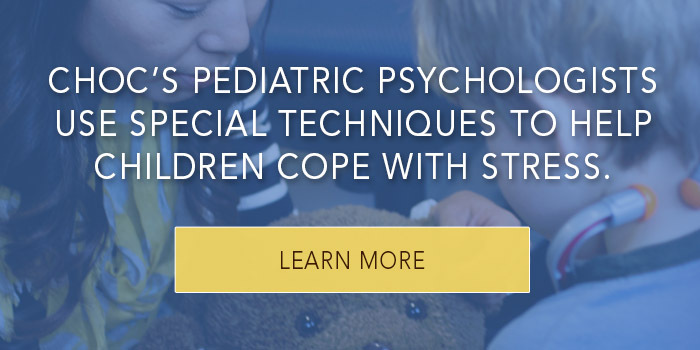 CHOC has a full-time child psychologist at the center who specializes in early detection and diagnosis of autistic spectrum disorders and other developmental disorders in children ages 1 year to 5 years old. If your child is between the ages of 12 months and 5 years, and you have a concern about their development and would like to schedule an autism assessment, please call CHOC Children’s Pediatric Psychology at 714-509-8481. If your child is 6 years or older, and needs a diagnostic assessment or you are interested in autism treatment services, please call the Center for Autism & Neurodevelopmental Disorders at 949-267-0400. Sometimes, illnesses and injuries—and the medications used to treat them—can have effects on the brain, causing problems with attention, learning, behavior, socialization or emotional control. 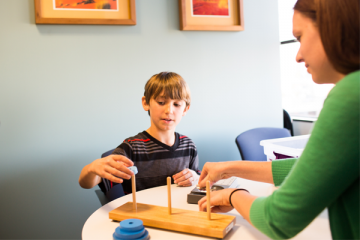 We offer comprehensive neuropsychological evaluations to assess cognitive function and recommend a treatment plan for children of all ages. Learn more about our Neuropsychology Program. Our psychologists are trained in pediatrics and know the best ways to help children and adolescents address mental health issues. These therapy methods, which can be different from the methods used for adults, give children and teens tools to deal with stress and unhealthy thoughts and behaviors. Our psychologists use a range of therapy techniques depending on a patient’s age, comfort level and unique needs. We may use “talk” therapy, medical play, art or games to encourage expression, family therapy and coping skills like hypnotherapy, biofeedback therapy and relaxation. We start therapy with a thorough evaluation to help diagnose and better understand your child’s condition before treatment begins. We evaluate children and adolescents by taking a history of the child’s thoughts, emotions and behaviors in different settings, including home, school and social environments. Therapy often works best when parents and families are involved. Your child’s therapist will discuss the best ways you can help your child get better. Can a child have a mental illness? Yes. Research shows that one out of five children has a diagnosable mental health condition, and more than one-third of visits to a pediatrician are for purely psychological reasons. In fact, signs of depression can appear as early as age five. The good news is that the earlier mental illness is treated, the better chance a child has to prevent long-term effects on his or her health and well-being. How do I know if my child has a serious mental health problem? Is no longer interested in activities they used to enjoy. When untreated, mental health disorders can lead to school failure, drug abuse, violence and even suicide. Most children who receive the right kind of help go on to live full and healthy lives. Seeking help early is key to a positive outcome. Practicing relaxation techniques to build coping skills. Supplemental reading material or homework may be provided to the child and/or parents between sessions and is reviewed in the next session. Homework can include activities like journaling or logging events between sessions, practicing new skills or engaging in an activity together as a family. Who will treat my child at CHOC? Psychologists: Psychologists work to meet the emotional, behavioral and psychological needs of the patient and family. They are not medical doctors, but have earned a doctorate degree. Neuropsychologists: Neuropsychologists are doctoral-trained psychologists who specialize in how diseases, injuries and disorders of the nervous system affect emotions and behaviors. Psychiatrists: Psychiatrists are medical doctors who treat mental health issues. They can prescribe medications, but may also use a number of counseling techniques. Social Workers: Social workers may provide counseling, advocate on a family’s behalf and assist with any psychosocial needs. CHOC is a teaching hospital, which means that advanced-training students may also be involved in your child's care. You will always be informed if a student is part of your care team. Learn more about what to expect at a teaching hospital. Should I try therapy or medication for my child? Sometimes, psychotherapies, behavioral strategies and family support may be all a child needs. In other cases, medications are needed to help the child cope. If medication is prescribed, the child should be monitored and evaluated regularly. Your child’s doctor or psychologist will discuss the treatment options with you. At CHOC, we have many health care professionals who can help you. You can call us at 714-509-8481. We may recommend that you visit your child's pediatrician or primary care doctor to be sure there isn't a medical cause for your child's condition. In the first few appointments, you and your clinician can both decide if he or she is the best person to provide the services you need in order to meet your child’s needs. If you have questions about therapy procedures, it is important that you discuss them whenever they arise. We will be happy to help you set up a meeting with another mental health professional for a second opinion. I am a student and interested in psychology training. What should I do? Pediatric Psychology Predoctoral Internship Program. CHOC offers teenagers experiencing symptoms of a mental health condition a new source of a hope in a validating, supportive environment staffed by experts in adolescent mental health. The ASPIRE® (After School Program Interventions and Resiliency Education) Intensive Outpatient Program at CHOC Children’s brings solutions to teens and their families who show moderate to severe symptoms of anxiety, depression or other mental health problems. Participants ages 13 to 18 attend after-school programming for three hours a day, four days a week in sessions that span eight weeks total. Get more information about the CHOC ASPIRE® Intensive Outpatient Program. Separation anxiety often happens when small children make big transitions to new places. Dr. Mery M. Taylor offers tips for parents to try to help their child cope. 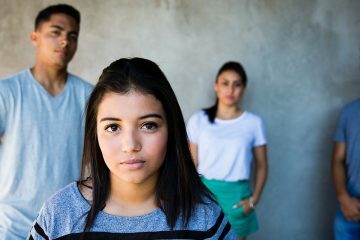 Dr. Mery Taylor explains why teens often have bad attitudes, and what parents can do to mitigate the effects of a dour disposition. Many parents know the disappointment of seeing their bright child score poorly on an exam even after hours of studying. Dr. Jonathan Romain explains that test anxiety can be managed and even conquered. It’s perfectly normal for parents to get mad at their children sometimes, but anger can have a negative effect on a child’s development. Dr. Nadia Torres-Eaton offers practical advice for parents to manage their anger. Please call us or search our directory to find a psychologist who can help your family. Our staff will assist you in making an appointment or obtaining a referral from your doctor or insurance company if needed. CHOC patients may also have appointments at the Center for Autism & Neurodevelopmental Disorders. To contact the center directly, please call 949-267-0400. The center is located at 2500 Red Hill Ave., 1st Floor, Santa Ana, CA, 92705. Parking is available in front of the building. Download directions. If you have scheduled your child’s first appointment with us, please fill out our New Patient Packet and bring it with you to your appointment. CHOC Children’s partners with a number of organizations to make sure all of our patients’ and families’ needs are met. In collaboration with CHOC Children’s, UC Irvine and Chapman University, the Center for Autism & Neurodevelopmental Disorders provides services for children from birth to 22 years of age with autism, attention deficit/hyperactivity disorder (ADHD) and other conditions. The center offers individual consultations, treatment recommendations, parent training, behavior intervention, speech and language therapy, psychology services and referrals to community resources. Learn more about the Center for Autism & Neurodevelopmental Disorders. Child Behavior Pathways, formerly known as CUIDAR, provides quality services to Orange County families and providers and promotes the social, emotional and cognitive development of children ages 0-5. The program helps children succeed in their home and school environments by placing an emphasis on parent/teacher education, prevention and early intervention and cultural needs throughout the community. Learn more about Child Behavior Pathways. Through a partnership between CHOC and the University of California, Irvine, the Help Me Grow program connects families with additional developmental resources for children up to age five. Care coordinators work one-on-one with families to find appropriate community services, including screenings, in-home training and parenting classes and support groups. Learn more about Help Me Grow. CHOC works closely with the Regional Center of Orange County (RCOC), a private, nonprofit organization that coordinates services and support for individuals with developmental disabilities and their families. Learn more about Regional Center of Orange County. Children and Youth Behavioral Health (CYBH) provides a broad range of services for behaviorally, emotionally or mentally disordered children and adolescents which include evaluation, therapy, medication management, crisis intervention and collateral services to parents and families. Referral for hospitalization or residential treatment, consultation to schools and other agencies, coordination with private and public services and case management for those placed in hospitals or other 24-hour settings are also provided. CYBH services are provided through outpatient clinics, residential programs, crisis services, full service partnerships (FSP), and specialized services. 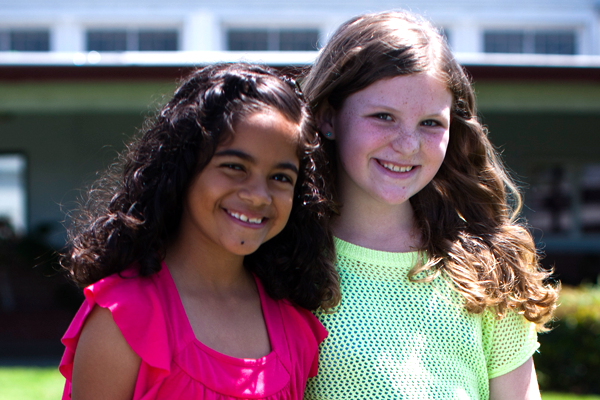 Learn more about Children and Youth Behavioral Health. If you would like to learn more about services available through the Orange County Health Care Agency, please call 1-855-OC-LINKS between the hours of 8 a.m. and 6 p.m. to be connected to a Behavioral Health Navigator. UC Irvine Health Psychiatry Services offers a full spectrum of comprehensive mental health services for children and adults, including inpatient hospitalization as well as outpatient and emergency psychiatry. Learn more about UC Irvine Health Psychiatry Services. Every child and young adult in Orange County who needs behavioral health treatment should receive it, without stigma or barriers to access. Despite the quality services provided at CHOC, it is not enough to meet the needs of the more than 150,000 Orange County children who have a mental health condition. We have partnered with community leaders and organizations to launch an initiative that will expand medical services and bring much-needed attention to pediatric mental illness in our community. Learn more and get helpful mental health information.